Deeper than the shade of Blue/ oil on canvas. 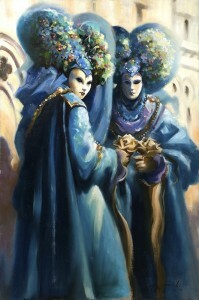 A major piece by Trevor done during the time of Carnivale in Venice. This large oil painting shows two figure in full costume with floral headpieces holding gold roses. Standing outside The Dodges Palace they are in white masks and blue robes looking, to all intents and purposes, like mirror images.